How is maximum profitability achieved? 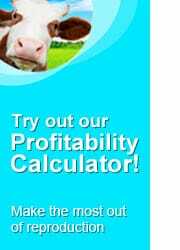 In order to maximise the profitability of a cattle farm, the aim is to produce one calf per cow per year. After calvingGiving birth to a calf., 45 days are necessary in order to ensure effective uterine involutionSpontaneous or induced decrease of a tissue, organ or tumour. Particular method of evolution of an organ in which its initial appearance is restored e.g. involution of the uterus after parturition.. At this stage, the cow must have shown a resumption of ovarian activity. She can be served from the 50th day onwards and then conception must take place before the 90th day. 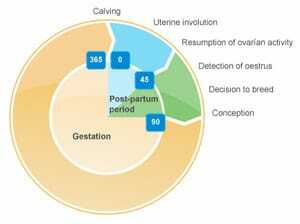 Since gestationState between implantation and parturition of female viviparous pregnant species. lasts for around 290 days, the breeder has only 40 days in which to ensure that the cow is fertilised, i.e., two or three potential periods of heatAlso “oestrus”. 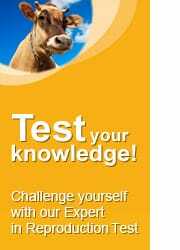 Physiological and behavioural phenomena that precedes and accompanies ovulation in female mammals..
Take an Expert in Reproduction Test for this first chapter.